The Tories’ average for February was 32.3%: up a tiny 0.2 points on January, but down 0.9 points on where the party was 12 months ago. Labour’s average of 33.5% was an improvement of 0.5 points on January, but down from 37.4% in March 2014. 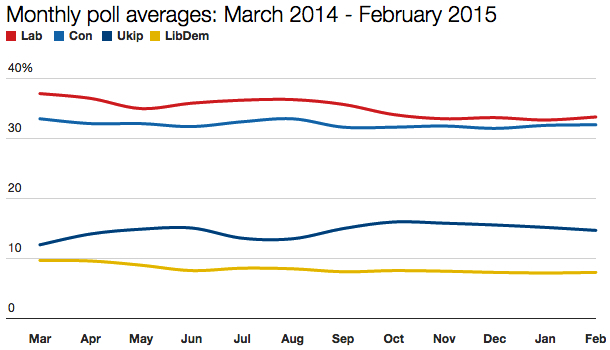 Ukip is continuing to register a decline in the polls, but it’s very modest. The party’s score of 14.6% for February is its lowest monthly average since August 2014. The biggest story of February, in so far as anything can be described as big in a month where no party rose or fell more than 0.5 points, concerns the Liberal Democrats. Halfway through the month the party was on 7.2%: another record low for this parliament. But they finished the month on 7.6%: not only up on 7.2%. but also above where they finished in January (7.5%). It’s the first time since October that the Lib Dems have ended a month higher than where they began. Granted, a month-on-month rise of 0.1 points is almost as small as you can get, but the fact the party put on 0.4 points in the second half of the month is noteworthy. Overall, the polls are continuing to pursue their trends of the past few months. This kind of pattern is not unexceptional; it happened in 2005, for example. But it’s a pattern that persists in failing to fit in with the narrative of some sections of the media, in particular some commentators and academics, whose analysis and predictions are rooted on the polls showing a swing back to the Tories and Labour. Maybe it will happen. Maybe it is already happening and the pollsters aren’t picking it up. For now, the polls continue to tell their own story and show their own trends. Whether any of it bears relation to the result of the general election is something that, as I’ve said many times, needs to be treated with extreme caution.